Claremont is a stunning subdivision in Greenville, South Carolina. Established in the early 2000’s, these homes for sale in Greenville are in a fairly new residential community. Just over 100 families are proud to call this neighborhood their home. Claremont homes for sale are located just off Roper Mountain Road, 8 miles east of downtown Greenville. Neighboring communities include Kilgore Farms and Kingsbridge. This is a quiet neighborhood with a stately clubhouse that provides elegant living mixed with entertainment and recreation. Register with the RE/MAX Moves team to receive access to advanced search tools. Save your favorite listings and receive an email notification when a home that meets your needs comes on the market. Claremont real estate is a 74 acre parcel of land that has been developed into an exclusive gated community, with 22 acres set aside as common ground. Having security and seclusion paired with a great location that offers professionals a short commute, it’s no wonder that this neighborhood is in high demand. Driving along the winding streets of this neighborhood, you’ll notice that many Claremont homes have been designed with traditional styling and have a touch of European flare. 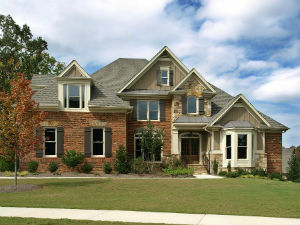 Many homes have brick or stone exterior finishes. Residents of Claremont homes have access to great amenities such as their clubhouse, resort style pool, walking trails and playground. Schools assigned to this community include Oakview Elementary, Beck Middle School and J.L. Mann High School. With a convenient location that’s close to shops and great restaurants this community appeals to couples, singles, retirees alike. Greenville has been recognized for being among the most family friendly communities in the area having been awarded the ‘10 Best Town for families in 2010’ by Family Circle Magazine. There are plenty of attractions in the surrounding area of Claremont such as the Greenville Zoo, concerts at the Amphitheater, the Discovery Island Water Park, or the urban waterfalls of Greenville’s inner city park in Falls Creek Park. If you’re interested in knowing more about Claremont homes for sale, please contact us or call us at today! Listing information last updated on April 25th, 2019 at 12:16am EDT.